According to the latest Customs data, China 17,884 tonnes of tin ore and concentrate in November 2018, 17,398 tonnes of which was imported from Myanmar. The tin content of ore imports from Myanmar was estimated at some 4,000 tonnes in November, down 45% from a year earlier and up 29% on the previous month. From January to November 2018, China imported an estimated 49,800 tonnes of tin-in-concentrate from Myanmar, down 11% from about 55,900 tonnes in the same period in 2017. Customs data also show that China imported 189 tonnes of tin ingots in November, about half of which came from Indonesia. Tin ingot exports in November totalled 683 tonnes, mainly to Malaysia, Hong Kong and Japan. Our view: According to feedback from local tin producers, the average grade of both tin ore and concentrate shipped from Myanmar in the fourth quarter decreased from 25% in the first nine months of 2018 to just 23%. The tin content of shipments from Myanmar to China in October has been revised down to 3,100 tonnes in October. The local raw ore production in Myanmar still depends on the re-mining of old mines, and the head grade has further declined, along with raw ore inventory at local mines in Wa. At the current tin price, the break-even cost is estimated to be met at tin grade of 0.9 – 1%. 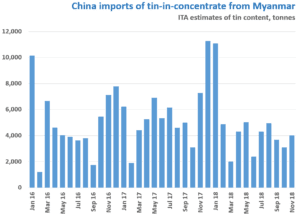 Our preliminary forecast of tin content exported to China from Myanmar in 2019 is 46,000 tonnes, including an estimated 4,000 tonnes of government stocks sale.